Disclaimer: I received a digital copy of this book via Penguin Random House & Netgalley in exchange for an honest review. SPOILER ALERT: It only takes one heartfelt book to change your opinion on an entire genre. I usually dismiss YA Contemporary as a genre I won’t ever be interested in, previously writing it off as fiction which relied on angst rather than creative worldbuilding to carry the plot. If I’m going to read fiction, I want wizards, faeries, shapeshifters, otherworldly settings, protagonists that will save the world… the whole shebang! Then Everything, Everything came along and crumbled my preconceived notions about the genre, proving that there’s a real magic in everyday experiences, too. The book follows Madeline, a girl who’s allergic to everything. Her only remaining family is her mother, who’s loving but overprotective. Consequentially, Madeline’s literally been locked inside her home for most of her life, the only people she interacts with are her mother, her nurse and her tutor. Despite this, she remains content with her palindromic life until a boy (it’s always a boy!) and his family moves in next door. Really there’s only one thing to wish for — a magical cure that will allow me to run free outside like a wild animal, but I never make that wish because it’s impossible. It’s like wishing that mermaid and dragons and unicorns were real. Instead I wish for something more likely than a cure. Something less likely to make us both sad. “World peace,” I say. Nicola Yoon’s writing is fantastic, especially considering that this is her debut novel. Her prose flowed in an effortless way, and her observations on the everyday joy that eludes Madeline are beautifully poignant. The book is also charming in the way which it’s littered with pictures, Madeline’s book reviews and instant messages log. However, I thought the development of Olly and Madeline’s relationship was too quick, as in its initial stages all we had to go by were excerpts of these brief message logs. However, reading this book made me quite cheerful so I was ready to forgive this relative lack of relationship development. How am I supposed to go back to being The Girl Who reads? Not that I begrudge my life in books. All I know about the world I’ve learned from them. But a description of a tree is not a tree, a thousand paper kisses will never equal to the feel of Olly’s lips against mine. I also appreciated the development of Madeline’s character and her growing curiosity about this world that healthy, normal people take for granted. For someone who was always satisfied with her lot in life, seeing Olly and the world that she was missing: friends, school, Maui, first loves… all amounted to an existential crisis which felt authentic. However, her solution to his dilemma is just so farfetched and unbelievable, my mouth was left agaped during the last third of the book. Everyone in the book just became so irresponsible, it made me wonder how any of these health professional kept their practising license? I work in the healthy industry, so the treatment of Madeline’s illness really bothered me. All my knowledge of the immune system and pathology was going haywire trying to make any sense of the event that unfolded. However, it was all saved by a killer plot twist, which turned a previous light and fluffy read to a story about domestic abuse: both in physical and mental sense. The ending left me a bit conflicted about the book, hence 4 instead of 5 stars. In two weeks my skin will have no memory of Olly’s hand on mine, but my brain will remember. We can have immortality or the memory of touch, but we can’t have both. The last third of the book here is really the clincher on whether you’ll enjoy it or not, so when you decide to pick this up, make sure to read ’til the very end! I thought that despite its flaws, this is a book with a large heart, great prose, and at the end of it a worthwhile message about living your life to the fullest. I would definitely recommend it to all those reluctant to try out contemporary fiction. ‹ PreviousDiscussion: Are You Review Ratings Objective or Subjective? This book is on my September TBR…can’t wait to pick it up! YA contemporary this year has been going pretty well. I’ve read some of them, and they’re actually great. I am really excited to read this one. It’s had polarizing reviews from many people I know, so I am no longer sure who I can identify most with. Great review! But yes contemporary YA looks fantastic this year, I need to read more 🙂 which did you enjoy? Ah yes both sounds wonderful especially The Walls Around Us! I’ll look into it, thanks Vane! I’ve read All The Bright Places and loved it! Will definitely look into Finding Audrey as I enjoyed Sophie Kinsella’s adult books! Thanks for the rec and I really hope you will love this book, too! I can’t wait until I can finally sit down and read my copy! Your review definitely pointed out a few aspects that other readers hadn’t mentioned such as the plot twist revealing some sort of abuse. That makes me even more intrigued to pick this up, so I shall be reading it soon. Great review Aentee! I hope I didn’t spoil anything for you! I wrote this review way back when I was a newbie blogger so it’s not as strong as my more recent ones. Hopefully you’ll enjoy the book as much as I did! I got this one from Netgalley too! I must read it ASAP! Lmao don’t read this review if you can help it. I wrote it ages ago and it embarrasses me a little. Have fun with this book, though. Would love to hear what you think of the ending! Aw! I’m super embarassed with my old reviews too… I feel ya! The ending of this book is a wee bit make or break as that plot twist is extreme, and Maddy makes some questionable decision. But I really loved the book’s tone and writing, so I really hope you’ll also enjoy it! It’s always great when the protagonist loves reading. 😀 I am glad you got into YA Contemporary because some of it is really worth reading. Maybe now I will harass you into reading The Fault In Our Stars 😛 I definitely can’t wait to read this novel! 😀 Thanks for the awesome review! This protagonist is also an awesome book reviewer, I would totally read the heck out of her blog haha. The next contemporary on my list might just have to be a John Green, to ssee what all the fuss is about. I hope you’ll end up enjoying this one!! Yay! 😀 Personally, I haven’t read any of his novels beside TFIOS. At first I loathed it because I found realistic fiction and particularly those have terminal illness to be quite boring. However, my best friend made me read it again after two years and I fell in love with it. Though it still hasn’t change my opinion on the rest of John Green’s novels though. I saw Paper Town the other day with my girlie and I didn’t like it apart from the fact that Mr. Green always delivered an excellent piece of message for life. After Paper Town I don’t know if I want to read it anymore. I am wary mainly because of the terminal illness plotline. I watch loads of K-drama and there's enough premature death by cancer there to last me a life time haha. But I will try and get around to TFIOS some day, it feels like compulsory reading for a book blogger haha. I actually don’t like YA contemp much too! I do respect it as a genre, and all the more for being able to craft a story WITHOUT magic and madness and murder, but I veer much more towards the spec fic side of the spectrum. And ooh, Everything, Everything reminds me of a legit illness where the patient’s immune system is very weak and they have to stay in a literal sterile plastic bubble for their entire life. But then Everything, Everything just doesn’t have that “YES GIVE IT TO ME” premise that I look for, even in contemporaries, so perhaps this one’s not for me. Great review anyways, Aentee! Same here, I respect it as a genre as it seems to touch so many people and create a space where current issues can be discussed without wearing the guise of dystopia etc…. but I just like seeing my dragons and magic! I think the illness in Everything, Everything is based on a real disease, so you are absolutely right! I hope you do enjoy it if you get around to reading it.. just, that ending = your mileage may vary haha. Wonderful review. A friend plans to lend this to me soon, and this intrigued me further! 😀 Lovely graphics AGAIN, Aentee! YOUR ART IS MAGIC. I’m so happy you enjoyed this one, Aentee. I fell in love with it and that twist totally surprised me. I know a lot of people are upset with the twist, but it worked for me. This is one of those books that made me FEEL so much that I didn’t care that it had some flaws. And yes to everything you said about Yoon’s writing! It had such a beautiful flow to it. I’m so happy you enjoyed this one! I’ve had the e-galley waiting for me for awhile now, but I just didn’t get to it before lending out my kindle. However, I already pre-ordered a copy and am very excited to read it soon! Glad this gave you a different perspective on the YA contemporary genre 🙂 Great review as always! You would lend out a KINDLE? You are a generous soul, Jeanette XD I would never part with my on pains of death haha 😉 But I hope you will enjoy this read! 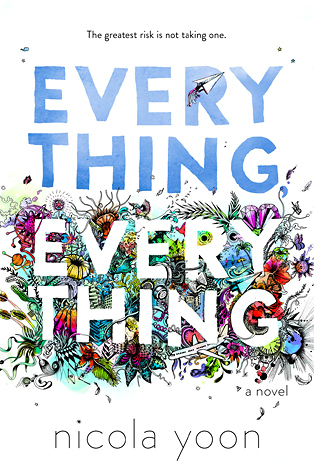 Everything, Everything made me want to experiment with more YA contemporary! To my mom, LOL. cause she’s reading some really massive book she didn’t want to carry around. I’ve heard great things about this book. When it comes to contemporaries the ones that always stick with me are the ones that have strong character development and I think this may be one of those books. I’ll definitely be checking it out. Great review. The characters and the writing are definitely the strong suit of this book, so if that’s what you are into, you will love this *fingers crossed for you, Lois*! Excellent review! I was definitely left little wide-eyed with the sheer amount of ignoring professional medical advice that Olly/Maddie did. The slow build relationship and the romance were a joy to read though. I know right! I was like WHAT ARE YOU DOING? YOU CAN DIE GIRL? WHY ARE YOU NOT DEAD YET? But the twist made sense of it in the end, I guess. Also, Maddy has the WORST nurse in the world, Y/Y? Both of them! I am glad you enjoyed this book, though. I’m sorry you don’t like YA Contemporary, but at the same time I’m glad that this one convinced you that maybe they’re not so bad! However, I totally understand why you love fantasy. AND OMG THAT TWIST – it still shocks me everytime I think about it. I just love fantasy a lot more, so I don’t have room in my book diet for contemporary unless they seem excellent! I am having quite good luck with my recent contemporary reads, though *cheers* Also, that twist changed the book for me, still unsure about it, but the rest of the book is SUPERB. I’m looking forward to reading this one. I can relate to loving some books despite character’s making frustrating decisions. Contemporary makes me smile (and I love finding new favourites) but my heart somehow gravitates back to SFF too. I just like stories with grander scope, so I guess that’s why I prefer SFF. Most contemporary takes place either in someone’s house or at high school, so I find it a little bit difficult to get excited. But the good ones are SO DELIGHTFUL and makes me all warm and fuzzy, so I do need to read more! Yes, this twist will either have you pleasantly shocked (which, yay!) or raging (which, also yay? because I love reading your snarky review XD *horrible person*) But I do hope you’ll love it just as much as your other contemporary reads this year! I think you vocalized my initial reason for why I didn’t originally want to read this i.e. the genre. This past year I just haven’t wanted to pick up anything contemporary but I have this on my TBR list for Arc August. Thanks to your wonderful points in this review, I’m 100% positive that I’ll be reading this within the next week or so! 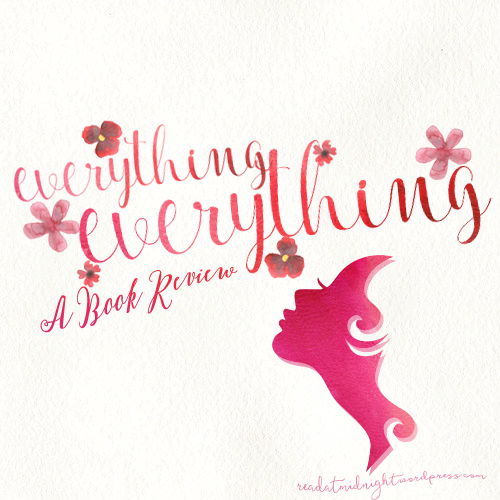 By the way, I absolutely adore your blog – it’s beautiful! What a fabulous review, Aentee! I’ve always been a huge contemporary reader, so no problems on this side. 🙂 I’ve heard lots of conflicting things about the ending–a few people even ended up hating the book because of that alone. I’m really curious about it! I’ve heard nothing but praise for this book, and you just increased my curiosity even more! I actually love books that don’t get really, really good until the end – as long as the beginning is intriguing as well – and that plot twist sounds wonderful. I know what you mean about one book changing your opinion on an entire genre – I’ve always been a contemporary YA reader, but I didn’t think I liked magical realism until I read The Strange and Beautiful Sorrows of Ava Lavender. Anyway, I think I might have to give this book a shot – thanks for the review! Great review, Aentee! Also, love the graphic. You're so friggin' talented! Thanks Rhea, I was actually too embarrassed to reread this review since I wrote it almost two months ago, but I am glad you think it did the book justice! Also so happy to hear that you enjoyed it, I can’t want to read more of Nicola Yoon’s book in the future. I AM HOPELESS. I really was super angry at this book and didn’t enjoy it at all, not even when the reveal made some of the plot inconsistencies make sense. *sigh* I think I’m the minority though, because I see a lot of praise for it! 😀 I AM GLAD YOU HAD A GOOD TIME WITH IT THO. And zomg, your graphics just make me pat my computer screen. BEAUTIFULNESS. I AM SORRY YOU HATED IT, CAIT. Though I can totally understand why, I nearly threw the book across the room at the 70% mark when Maddy and her nurse completely lost their marbles. But the ending was palatable enough to save the book for me. Contemporary is not my thing, honestly but your review urged me to give this a chance. Great post, Aentee! I don’t usually read contemporary books too, but I am intrigued. Thank you!! I do recommend it, especially because it’s quite a short read 😀 Caveat for the ending though.